Trim the tops from the beets and peel. 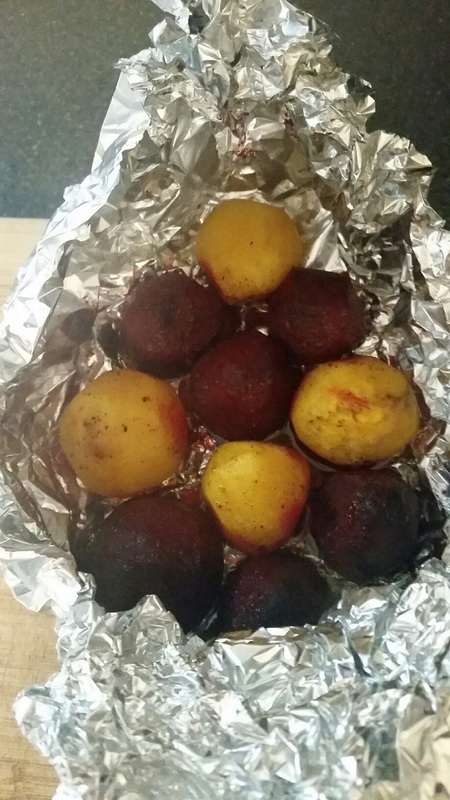 Place the beets in a large piece of tin foil and drizzle with olive oil and sprinkle with salt and pepper. Close the tin foil loosely around the beets and bake in a 400 degree oven for one hour. Remove from foil packet and let cool. Slice the beets and set aside. Be careful as red beets will stain your cutting boards and your clothes! Form the goat cheese into small marble sized balls. You should get 14-16 out of the 4oz package. 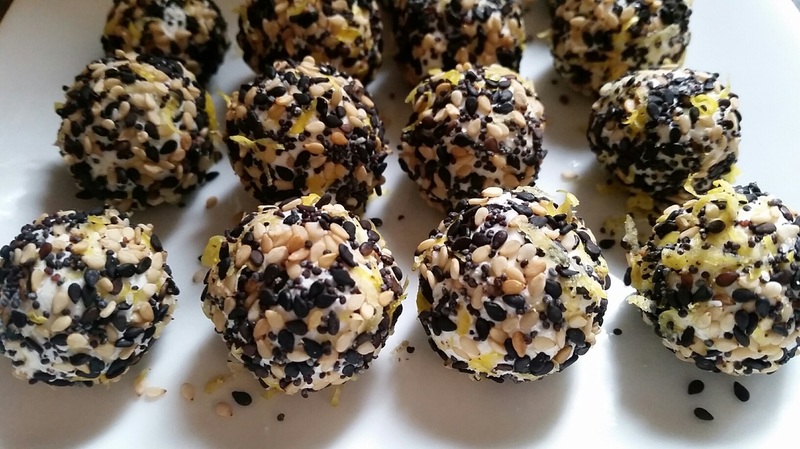 Place the sesame seeds, poppy seeds, lemon zest and a little salt and pepper in a separate bowl and roll the goat cheese balls in the seed mixture to cover. Set aside. Place the chicken breasts between two large pieces of plastic wrap and pound with a meat mallet until they are all the same thickness, about ¾". Season both sides of the chicken with salt and pepper. In three separate bowls, setup your dredging station. One bowl with flour, one with eggs and one with panko bread crumbs and parmesan cheese. Dredge the chicken first in the flour, shaking off any excess, then dip into the eggs, then into the panko mixture, pressing to adhere. In a large saute pan, add enough olive oil to lightly coat the bottom of the pan. Place the pan over medium heat and let it warm up for 2-3 minutes. Add the chicken breasts and cook for 4-5 minutes on each side or until dark golden brown, adding more olive oil if necessary. Let rest on a plate for 10 minutes and then cut into strips. To build your salad, place the mixed greens on a plate and then shingle 5-6 pieces of the roasted beets on one side and then add the strips of chicken and place 5-6 goat cheese balls on the plate. 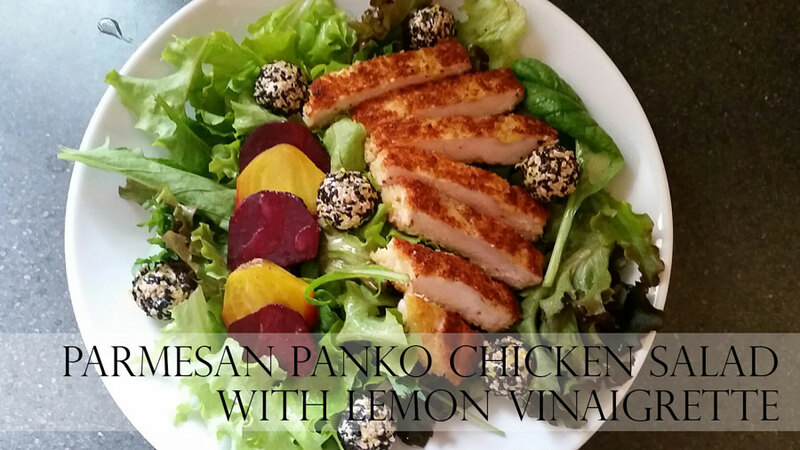 Drizzle with the lemon vinaigrette. Place all of the ingredients in a Tupperware container and cover tightly. Shake vigorously until the vinaigrette emulsifies and looks 'cloudy.' Season to taste with salt and pepper.